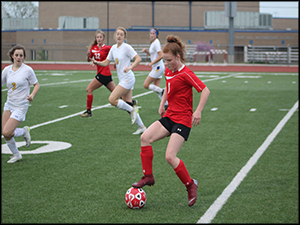 On Tuesday evening, the girl’s soccer team had a battle on their home turf against Circle. The game started off with both teams unable to find a path to the back of the net. There were 19 shots combined in the first half but the goalies were impenetrable. However, the second half was a different story. Korryn Hackney came out strong as she scored the first goal of the game. After that, the Thunderbirds picked up their game as they quickly scored three goals to put them ahead 3-1. Even with the Rockets all-out effort, they were unable to make a comeback. Their next game will be on Thursday, April 18 in Buhler.